Are you looking to buy the new Oppo R5? The Chinese R5 which measures only 4.85 millimetres is the world's thinnest smartphone. Read the article to know its features, specifications, price and review. In this era of high competition, smartphone manufacturers are doing everything possible in order to outdo each other. Every new smartphone these days seems to be creating its own identity. The new Oppo R5 is also one in the race. The Chinese R5 which measures just 4.85 millimetres is crowned as the world's thinnest smartphone. It is a very good looking device but does it perform equally well? I spent a week with this device and here's what I have to say. The device is incredibly thin- just 4.85 mm. It is 148.9 mm long and 74.5 mm wide. My first reaction on seeing this phone in person was- ' How did they fit it all in there!'. After seeing this phone, you will feel that every other phone is too thick. But too much of thinness has led to some design flaws. For example, the camera sticks out from the slim body which increases the tendency of the device to topple down when kept on flat surface. Similarly, the 3.5mm audio jack seen in all other phones is eliminated in the R5. 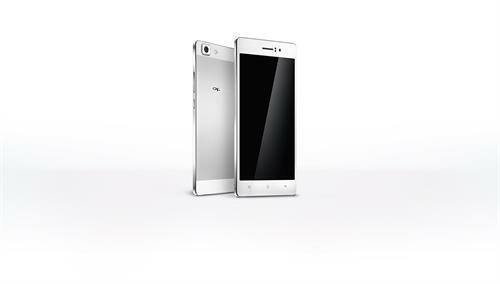 At present, the Oppo R5 is available only in white color and it features a premium looking customised matte (thinner than ordinary paints) metal backplate with tastefully engraved Oppo logo. The front of the device is primarily dominated by a 5.2-inch AMOLED screen with 1080x1920 pixels resolution. To protect against scratches, Corning's Gorilla Glass 3 is used. The screen has good viewing angles and sunlight legibility but a distracting thin black border too. Below the screen, there are capacitive-based Home, Menu & Back buttons. On the top & bottom edges, there are plastic strips for Wi-Fi & cellular reception. On the left edge, there are both volume & power buttons. All the buttons are easily reachable and offer decent tactile feedback. The build quality is good but due to excessive use of metal, the phone feels quite heavy (155g). The Oppo R5 is more of a show piece and is clearly low on features & specifications. Continue reading to know how. The new R5 is powered by Qualcomm Snapdragon 615 SoC with four 1.5 GHz Cortex-A53 cores & four 1.0 GHz Cortex-A53 cores. This is backed by 2 GB RAM. The phone runs Android 4.4.2 with Oppo's custom Color OS 2.0 Android skin on top of it. This software puts great focus on bright colors and customization. Oppo's online store offers a variety of free and paid themes. One very interesting feature of the Color OS is its gesture board which appears on swiping up from the Home key. On drawing any gesture, action associated with it gets activated. For example, letter 'O' opens camera and 'V' opens flashlight app by default. You can add your own gestures as shortcuts. The UI is neat & clutter free. The phone has some useful third party apps including NearMeCloud and WeChat. However, unlike in iOS and skins of Chinese smartphones Xiaomi & Gionee, there is no app drawer. During the test period, there were no lags or hangups as I surfed internet and played videos. Multitasking was also easy but launching & switching between apps caused the back-plate to become hot which is disappointing. The sound was loud & clear without any distortions but not as good as that of the N3. The phone is so thin that there is no space for a dedicated loudspeaker and hence sound just emanates from its earpiece. The call quality was okay most of the time. At times, the person on other side sounded weird and there were some call drops as well. The phone features a 13 MP primary camera (protruded out in left corner) with Sony Exmor IMX214 BSI sensor having low dynamic range. It captures well detailed images with no pixelation and just the right color temperature. Images taken in low lighting conditions were also okay. The camera is not great but gets the job done. There is some problem with exposure settings due to which there were a bit overblown highlights but you can solve this with the HDR mode. The 5-megapixel front camera with 88-degree wide angle lens is okay for selfies. There are enough of editing features so you can create picture perfect images with it. The phone has 16 GB internal storage of which 12 GB is available for users but disappointingly, there's no microSD card slot if you want to store more. It has all standard wireless protocols including Wi-Fi a/b/g/n, Bluetooth v4.0 & GPS and can also connect to LTE on all Indian cellular networks. The 2,000mAh Li-Ion battery of the phone is very small by standards of high-end Android devices and it lasted for only 5 hours under heavy usage. When using this phone, I was constantly looking for a charging point wherever I went. The good thing is that it charges amazingly fast (75% in just 30 minutes) because of VOCC rapid charging technology. At Rs. 29990, the new Oppo R5 is priced in premium category but it has some serious issues due its ultra-thin size. The phone compromises on hardware specification (including exclusion of standard 3.5mm jack & storage limitation) and capacity of the battery. Moreover, the phone gets heated up very quickly due to lack of volume in it. It is currently the slimmest smartphone in market. Also, it is one of the most attractive ones and wherever you go, it just makes heads turn around. All my friends wanted to try this device in their hands. So if you are looking for style over performance, buy the Oppo R5. Else, Moto X (Gen2), LG G2 and Nexus 5 are some good alternatives in this price range. The phone's gold version by the name of Guided Edition will also be launched soon. This will be priced higher than the regular R5 and we hope that it performs better too. Oppo Find 5 vs HTC J Butterfly: Head - to - Head Comparison is given here. The Oppo Find 5 which was unveiled a day ago will give a tough competition to HTC J Butterfly and Samsung Galaxy Note 2. Touted as the world’s first 5 inch smartphone with a Full HD (1920 x 1080) display, the Oppo Find 5 would reach the shores of China in November. Here let us find the basic difference between Oppo Find 5 and HTC Butterfly and find which would be the better choice. This article provides a comparison between the unique selling points of the Vivo X5Max and the Oppo N1 smartphones. You can check out head to head the general looks as well as their inbuilt features which make them unique in their own respective ways. Looking for the complete Oppo F1s specifications and price? Here we have the detailed review, pros and cons and price of the new Oppo F1s selfie expert. Find all details including the release date.